Renewable technologies are becoming more commonly applied in UK homes, with more householders installing solar panels than ever before. But when it comes to sources of heat, most houses are still fitted with ‘traditional’ boilers, and many homeowners are unaware of the alternatives available. However, 2018 looks to be a turning point, with heat pump applications increasing because of the benefits they offer. For many governments across Europe, the key policy driver leading to the rise of heat pumps is climate change, as governments look to reduce their reliance on traditional fossil fuels. According to the European Heat Pump Market and Statistics Report 2017, the market grew for a third year in a row, rising by 12% or nearly 1 million units. The UK government forecasts the sale of one million heat pumps a year by 2030, with 2017 seeing the installation of roughly 22,000 new heat pumps, an increase in 18% on the previous year. It’s much the same across most of Europe. In Germany heat pumps were installed in 43% of residential buildings in 2017, moving ahead of gas heaters for the first time ever (which represented 42% of installations). Under its government’s ‘Energy Agenda’, The Netherlands, a long-time gas producer, is turning towards heat pumps as it plans to reduce CO2 emissions from the built environment by 80% by 2050. And in Denmark, estimates suggest heat pump sales will reach 600,000 by 2050 – the year when the nation plans to be completely free of fossil fuels. Make no mistake - heat pumps have long been embraced for their ability to offer a reduction in running costs, increase efficiencies and offer a pathway to a cleaner, greener future. They are excellent solutions for residential home owners looking to reduce energy consumption and save money on bills. They are also increasingly becoming first choice for housing associations thanks to their cost-effective use of renewable energy, helping to keep the costs down for both landlords and tenants. Designed for retro-fitting, suitable for almost any property, heat pumps are even able to work alongside existing heating systems in a hybrid situation if required, completely removing the need for expensive retrofitting. However, to really explain why 2018 is the inflection point where heat pumps truly start to take over, we need to look deeper. With oil prices at the highest level for the last three years, and the RHI programme lifetime extended to 2021, the arguments for adopting heat pumps are growing stronger. There are some great innovations coming in, not just from the UK but also from global companies that will help to raise standards and contribute to a more dynamic heating market in the UK. There is, of course, the low carbon economy roadmap, put in place by the EU. Regardless of whatever Brexit we end up with, the UK government has already agreed to incorporate EU Law into UK Law, so this will still impact UK businesses. The roadmap declares that by 2050, all members of the EU should cut greenhouse gas emissions to 80%, below the levels produced in 1990. It also lists a number of milestones required in order to achieve this - 40% emissions cuts by 2030; and 60% by 2040. Targets in legislation like this are helping to shift the continent’s reliance away from its ageing gas supply chain, whilst also creating a sustainable future for off-grid homes – where heat pumps can once again offer a happy alternative to bulky fuel delivery and storage. 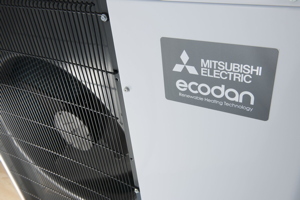 With the next iteration of the ECO scheme, due to run from 2018-2022, there is hope that the heat pump market will receive greater attention than traditional fossil-fuel based heating. With the Home Heating Cost Reduction Obligation (HHCRO) suppliers must promote measures to improve the ability of households to heat their homes. With around 3.6 million homes in England and Wales off the mains gas grid, there is more than enough of a target market for installers. It’s safe to say that the future for the heat pump looks bright. But there is still a lot to be done to ensure they penetrate the market as expected. Price has always been a major factor determining their uptake - yes, they do bring significant cost savings over time, but they aren’t cheap and do require initial upfront expenditure. 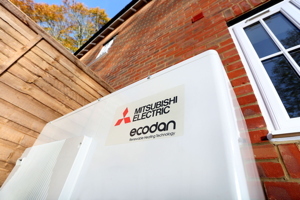 Heat pumps are on the frontline as renewable energy becomes increasingly commonplace across UK homes. The UK government has pledged to get 15% of its energy from renewable sources by 2020, and with heat pumps a guaranteed way to reduce dependency on traditional sources of energy, it is likely to government will continue to push the virtues of the technology. Most heat pumps are very quiet in operation and the quieter the heat pump, the more flexibility there is in where it can be positioned to ensure no disturbance to homeowner or neighbour. These ultra-quiet heat pumps are set to become very common across installations where space is at a premium. Ongoing technological development is also crucial to further advance the pace at which home owners can be given the ultimate flexibility they need to install the device. As is education, to ensure the energy and efficiency advances become increasingly recognised by not only builders, planners and contractors but also by homeowners and self-build developers. The support from the government should not be underestimated and is essential for the heat pump market to continue to thrive. All of this presents an exciting challenge and opportunity to those in the industry. It means that it is officially time for everybody to come together, take this momentum, build on it and stand united to create an increasingly low carbon future. * European Heat Pump Market and Statistics Report 2017 from EHPA see second link below.